See what we can do for your small business. Become a subscriber and enjoy savings on specials and promotions. 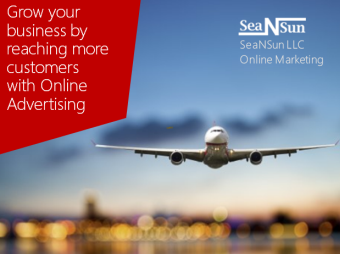 Sea N Sun is an online marketing and products company dedicated to helping small business owners succeed with their marketing efforts on the internet. We get your message in front of potential customer’s right when they're searching for what you have to offer. Whether through Google®, Yahoo®, Bing®, Facebook® or other Social Media, Email or Blog Site. There is no longer any doubt that buyers go online to research and purchase products and services. Companies that have websites and market online can reap the rewards of connecting with these potential customers. 94% of consumers research products & services online before buying. Three out of five people use search engines as a shopping resource. 78% of households in North America use the Internet. 272 million people are online in North America. Connect with Internet searchers on the Google®, Yahoo® and Bing® Network. Reach potential customers anytime, anywhere and on any device. Let us analyze and optimize your website to display in organic searches. Let us help you create compelling ads that maximize conversions and grow your business. Grow your business by reaching more customers with Online Ads. Grow your business by reaching more customers! Search engine optimization is about making modifications to parts of your website that impact your site's user experience and performance in organic search results. 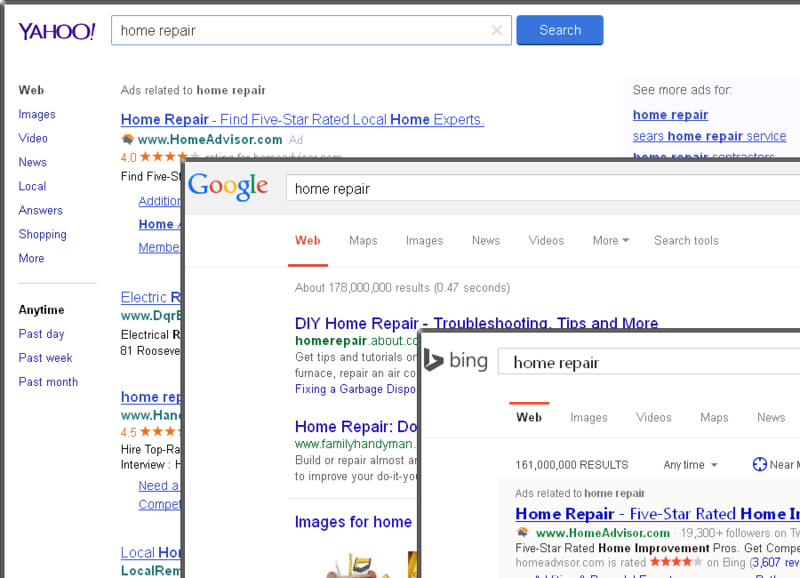 Search engine optimization affects only organic search results, not paid or "sponsored" results. By optimizing or "making modifications" to your website to meet search engine guidelines you better the chance of your website being displayed in a search result when a potential customer searches for your product or service in Google ®, Bing ®, Yahoo ®, etc..
Three out of five people use search engines to find products and services so when your optimized website displays in a search result it's free advertising displaying your brand, products or services and in the right place at the right time for a new customer to see your brand. Sea N Sun analyzes your website for SEO issues following the best practices that will make it easier for search engines to crawl, index and understand your content. Search engine optimization is about putting your site's best foot forward when it comes to visibility in search engines. Outlined below are some of the key elements we analyze. Reach the Right customers at the Right time with the Right message! Reach your ideal audience on the Google®, Yahoo® & Bing® Networks. Find searchers who are local, global and mobile. Reach a high-quality audience with ads that reach searchers across all devices. Target by location, time, demographics, age and gender, and even by device to find your perfect customer. Target your ads to specific device operating systems and promote your closest business location so customers can easily find you. 76% of Smartphone searchers have used a store locator or location extension in search results to help them find and visit a local store. Three out of four purchases resulting from a mobile search take place in a physical store. 81% of tablet owners use those devices for local searches. 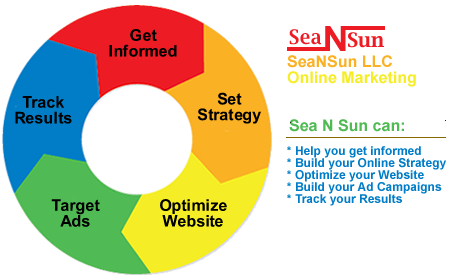 Contact Sea N Sun today to put online marketing strategies in place for your business. We can develop custom online marketing strategies tailored specifically to your business and help you grow your business by reaching more customers! By writing compelling ads that target the right customers, we will help increase your clickthrough rate. Using bidding strategies for your online ad to have a better position to give you a better chance of attracting the attention of your target customers. Using targeting strategies we reach a more relevant audience and help improve your chances for conversions. We can target customers by location, age and gender, device used for the search, or by the time of day and day of week. Connect with Internet searchers who spend more online. Let us create compelling ads that maximize conversions and grow your business. Take charge of your online reputation! Sea N Sun products and services get you found on the web and brand yourself or your small business name.